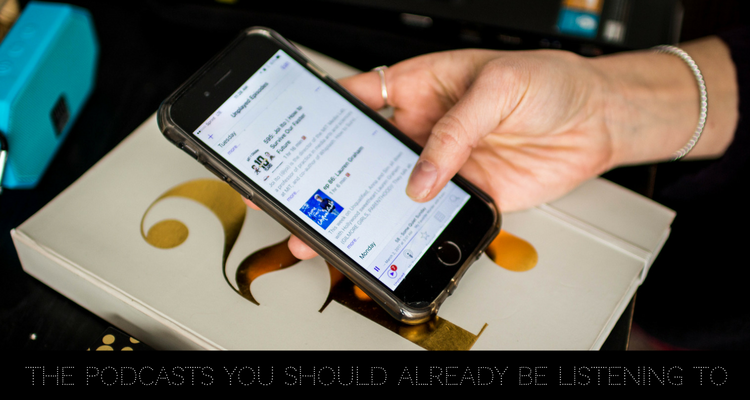 Podcasts You Should Already Be Listening To. Anyone who knows me knows that within the last few months I have become hooked on listening to podcasts. I honestly can't even tell you how many I actively subscribe to and keep up with because I think it may be close to 30. In the morning while I get ready, I turn on a podcast. When I am driving to work, I turn on a podcast. When I need to zone out and do mindless administrative things at work, I turn on a podcast. When I'm showering, I turn on a podcast (I even bought a waterproof shower speaker so I wouldn't ruin my phone). I am constantly listening to them!! So what podcasts have been capturing my attention? Generally, I have pretty eclectic taste. In turn, I listen to a little bit of everything, but given my newfound love for podcasts, I took a stab at putting together a list of a few favorites to share with you guys in the event you're ever seeking some new listening material! Harry Potter & The Sacred Text : Think bible study focused on Harry Potter books. Each chapter has a different theme and you can read along with them to break down the classics and see them in a whole new way. LORE : I love myths, folklore, and the paranormal. Lore has a little bit of all of that. Aaron Mahnke's voice and storytelling is not only compelling and captivating, but it will have you jumping on the bandwagon and listening to the bi-weekly podcasts. I look forward to every other Monday morning for a new one. Unexplained : To be completely honest, I am not that into the hosts voice but the stories he tells are interesting and keeps me engaged. In The Dark : I haven't fully gotten into this story yet however as it was set to being released, an arrest was finally made on this 30+ year old cold case of Jacob Wetterling. This American Life : Such a great collective of journalists that cover any type of story. Invisibilia : Another NPR favorite. With only one season down, they tackle the "invisible forces" around us. The episode, The Problem With the Solution, was eye opening. Pod Save America : A great weekly summary of the crazy political landscape in America. Warning- the hosts are pretty liberal ex-Obama staffers. The Art of Charm : I am just getting into this one but a great inspirational and motivational weekly podcasts that has really gotten me inspired. The Message/LifeAfter : They are season 1 and 2 respectively (you don't need to listen in order). Both are captivating but LifeAfter is a thriller and the ending you don't see coming. Tanis : From the same studio that create The Black Tapes (another favorite! ), I just finished this interesting podcast that just kicked off season 3. What is Tanis and is it even real?? LimeTown : How does a whole town just simply vanish? Limetown was one of the first podcasts I couldn't stop listening to and I have been eagerly awaiting to find out what happened in the cliffhanger last episode. Why Oh Why : Andrea finds herself newly and unexpectedly single. She breaks down dating in NYC and other various topics in life as a single person trying to get by. DTR : From Tinder, they break down dating. They don't have too many episodes but this one, Unexpected Places, was a surprising and amazing story. Anna Faris is Unqualified! : She chats with celebrities about life, crazy fictional scenarios, and gives listeners advice. Remarkable Lives; Tragic Deaths : A highly stylized recount of famous individuals lives and deaths. Most of the people they've highlighted, I thought I knew about them but was surprised with new details and facts. Watch What Crappens : A podcast about all the amazing Bravo TV shows?! Ummm there is no need to discuss that amazing-nes..
Do you have any podcasts you really like? Limetown was sooo addictive! I just finished up season 1 of Homecoming . It was really good too and was similar to the type of podcast Limetown is. It has some famous actors as the voices too, though David Schwimmer kept throwing me off. Ross as the boss? !